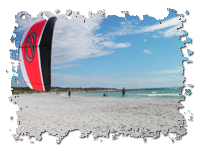 Start your kiteboarding experience by learning kite control on the beach. Learn kite flying skills on a small foil kite, guided by professional kiteboarding coaches and get up and riding the waves in no time at all. This 2hr lesson gives you the skills and confidence to start flying more advanced kites and moving on to body drag exercises. This 2-hour introductory course is for people who want to start kiteboarding and get a basic understanding of how kiting works. Learning to fly and control a powerful kite is one of the most important skills to master. These kiteboarding kites can power up very fast and lift you right into the air with serious consequences if not handled correctly. Learning where the power comes from and how to control it means that you will always be in control of your kiting session and confident when taking on open water and riding in the sea.